Watertower As Light Catcher « Adafruit Industries – Makers, hackers, artists, designers and engineers! Watertower As Light Catcher by Tom Fruin, photo by ROBERT BANAT. On the night of June 3rd, 2012, Tom Fruin’s newest sculptural artwork, Watertower, was installed on a rooftop near the Manhattan Bridge in DUMBO. The colorfully constructed Watertower features approximately a thousand pieces of foraged plexiglass mounted on a steel skeleton. The monumental patchwork of colored glass also includes an interior and exterior ladder and an operable roof hatch. The great amount of plexiglass used for the piece, which measures 25 feet in height and 10 feet in diameter, was collected all throughout New York City. 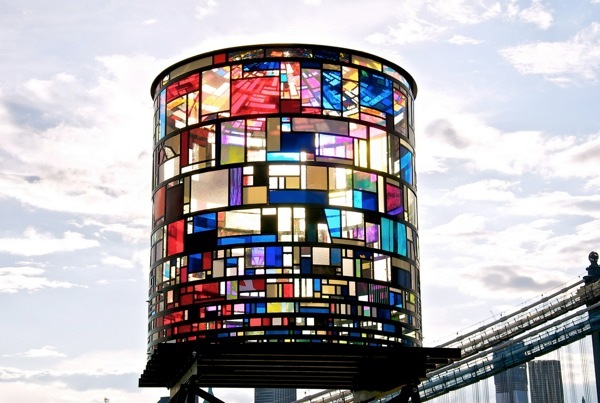 The use of recycled materials is not new to Tom Fruin Studio, as Watertower is the fourth scavenged artwork of the “Icon” series dedicated to creating tributes to the world’s architectural and sculptural icons using reclaimed materials.